We are excited that Autumn is pretty much upon us here in London. Which not only means colourful leaves, but also provides longer evenings to knit and listen to podcasts. A combination made in yarn heaven. So get those needles (or hooks!) ready for our latest episode! Make sure to download the Soundcloud app if you want to listen on a mobile device, or if you subscribe to Pomcast on iTunes it should appear on your device now! All episodes of Pomcast are also now available on Stitcher too. And while you’re having a listen, why not rate us or even leave a little review – thanks! Thanks to our sponsors for this episode Nature’s Luxury! We had a little swatch with the silky ‘On Stage’ – check out the reviews section to find out more and also how you can win some too! We’ve also been busy with our photoshoot for Issue 23 (more news on the winter issue soon!) and enjoyed seeing the beautiful sheeps and lovely peeps at Yarndale. Above is our stand with some of the glorious Issue 22 samples. Lydia’s love for looms hasn’t abated yet as she’s finished another beautiful scarf – she’s not neglected her knitting though as she’s also working on an Elibelinde using a natural colour of the De Rerum Natura Ulyse. Sophie is nearly at the finishing line with her Tinea! If you’re working on a Pom Pom project, you can join in the pattern chat via the Ravelry Pom Pom group and don’t forget to enter out KAL’s too. Our lovely sponsors Nature’s Luxury sent us some silky skeins of ‘On Stage’. A blend of 50% wool, 30% silk and 20% camel we loved this bouncy blend with great stitch definition. Super soft too and with a lovely drape, we’re thinking for shawls or lacey tops this yarn would be a winner. We used the stitch dictionary from Knitting Outside the Box (pattern no. Lace 3) for this swatch in the colour Windswept – we love that all the colour names of this yarn are named after songs! We also have been reading Clara Parkes new book ‘A Stash Of One’s Own – Knitters on Loving, Living with, and Letting Go of Yarn’. An anthology of knitters stories, curated by Clara which celebrate yarn and what it means to them have a stash. Here Clara is at Pomfest, and instead of our usual interview, we have a recording from Pomfest of Clara reading Debbie Stoller’s chapter. What a treat. And as a giveaway we have a copy of Clara’s book, along with a mini stash! Three skeins of the gorgeous On Stage reviewed above in the colours Bette Davies Eyes, Skandal um Rosy, and Kalimba de Luna. To be in with a chance of winning comment here telling us what song you would like a colour names after. And perhaps even tell us what that colour would look like! Comment by Sunday 8th October. Good luck! Inspired by Clara Parkes, we list the top skeins in our stash! Listen to find out what we chose. Thanks as always for listening! The next two podcasts will be a slightly different format as our producer Eli is on paternity leave, so we’ll have the Knitters in the Round discussions hosted by the ever effervescent Anna Maltz from Pomfest for your listening pleasure! I’d love a colourway named after José Gonzalez’s Remains – I imagine maybe a dusty pink/grey colour! Thanks for the giveaway! Hi, thank you for another great podcast. Song name would be Lucy in the Sky with Diamonds. our little seven months month old niece was named Lucy, after the song, by her 6 year old brother. Her parents are Beatles enthusiast, so not a bad name choice for a six year old. I would name a skein after Prince’s Purple Rain, and it would of corse be purple, with gray and blue in there too. Thanks for such a delightful podcast! You both make me smile and giggle. Listening to Clara read Debbie’s chapter was really moving and makes me so proud to be a woman who crafts. In sisterhood with Debbie’s sentiments, I would call a colorway “She Works Hard For Her Money”, a song by Donna Summer. It would have to be in a range of greens. What a fantastic giveaway! I would choose ” My Funny Valentine” (Chet Baker) and it would be a red with some orange undertones. This yarn looks scrumptious. So excited by A Stash of One’s Own- I read A Room of One’s Own when I was a sad, brokenhearted 14 year old girl and it electrified me. Sometimes people say that a break-up can play a role in shapin you but I really think that book, and when I read it, has contributed so much to who I am now. The first song that popped into my head, so going to go with my gut feeling, is Rhiannon Gidden’s Julie, because Rhiannon Giddens is so powerful and amazing, and because the song, to me, feels very feminist in it’s rebellion. It’s an important story but also hopeful. I think the colour would be a rich smoky aubergine purple with grey undertones. Love love love the podcast- thank you!! Lovely give away- thank you as well!! I would name a yarn “Shake Your Grove Thing” – and it would be lovely purples! My favorite song right now is “Sign of the Times” by Harry Styles. I would go for a multi-colored yarn for this one, probably doing the colors of the rainbow. Enjoyed the podcast! The song I would choose is “One of These Nights” (Eagles) and midnight blue with speckles of white, purple, and green. I would name a color “tonight, tonight”(the smashing pumpkins) and it would be a dark-golden coloring with midnight blue in it as well and maybe black speckles… it’s an awesome idea to name colorways after songs! So much Inspiration! Hi! Thanks for an inspiring podcast–I was at Pomfest, listening to Clara’s talk, but sat in the far back of the room, where I couldn’t hear her very well. So this was a treat. Thanks to for another great giveaway. I think that “Tangled up in Blue”, by, the also inspiring, Bob Dylan. I’m imagining a varied range of blues–dark, dark, blue, with a medium and pale blue, with maybe a speckling of preachiness, scattered throughout–Lush!! Such a great episode! I would like a yarn named “Pajammin'” after the Good Luck song. I think it would be a pale greyish lavender (to evoke the feeling of washed out, comfy and faded pajamas) but with speckles in magenta and hot pink, because it’s a very fun and happy song! Elton John’s Crocodile Rock – in a vibrant, lush, bright green! Hi! I loved this podcast, the song I would name a yarn would be Jolene by Dolly Parton and the yarn would be a really rich jeweled tone red. Sky Full of Stars by Coldplay. Black or super dark purple yarn with creams and light greys speckled all over. Sort of an inverse to your typical speckle! I would love a yarn named after David Bowies “Modern Love” – it would be a silvery grey with blue and yellow speckles. Everyday is like Sunday by Morrissey. Trudging slowly over wet sand would be a marl brown/cream with flecks of silver. Dance me to the End of Love would be my song title, and it would be a gradient from indigo to purple. A lovely podcast- I found Clara’s reading profoundly moving, actually. It certainly made me proud to be a woman with a stash of one’s own! I’d have to name a yarn after The National’s ‘Slow Show’, it’d be a midnight blue, with grey undertones. I think Justin Hayward’s Forever Autumn would be in my song title and the colouway rust and oranges..
Welp, a friend and I have a plan-slash-fantasy to have an alpaca farm where the two stud alpacas would be named Brian Eno and David Byrne. So I think perhaps that Silver Morning (which is on Eno’s Apollo: Atmospheres and Soundtracks) would be a good color. It would be a gradient color that goes from silver to pale green and blue. To be fair to DB, another colorway would be Crosseyed and Painless, which would be another gradient of beigy-bronze to a hazel green that might make one a bit crosseyed to see where the colors meet, but painless because it would be so pretty. How about Nakita by Elton John. The color-way would be an icy blue or soft gray. Another great episode! Like many, I have Tom Petty on the brain this week. I would love a “Free Fallin'” skein in icy whites and blues! “Isn’t She Lovely” by Stevie Wonder. This could really be any lovely color, but yellow comes to mind. Really enjoyed this episode! Hmm, I’m thinking ‘Feeling Good’ by Nina Simone in royal purple overlaid with teal. And So It Goes by Billy Joel, a simple yet emotion filled song of vulnerability. I think it could be a dark tonal blue with a tiny bit of green, like the impossible blue of the sky after the sun goes down. “Bungle in the Jungle” Jethro Tull is the song my husband used to propose. I envision the yarn being a variegated green yarn. Brown-eyed Girl by Van the Man. Because it’s autumn, and I’m in that kind of mood, I would choose Passing Afternoon by Iron & Wine. It would be a rich golden yellow colour I think. “Every Day is Halloween” by Ministry would be amusing. It would be black as midnight on a moonless night. The Sunny Side of the Street: a soft sunshiney golden of course! Definitely Hallelujah, the Rufus Wainwright version. It would be that deep, glowy sapphire blue color of the sky when sunrise is coming but it hasn’t started to get light yet. Great topic for this episode, I love pairing colors with song names! Hmmm….I’m always awful at this sort of thing! I’ll go with Pancho and Lefty by Townes van Zandt.it would be a warm desert hues. A burnt orange with hints of sage would be perfect. The show by lenka. It would be either cream or light gray with all the colors speckled in. Wine, ceruleon, orange, mustard yellow, coral, raspberry, kelly green…. and many more. Since it’s my current ear worm – ‘Up all night’ by Beck – deep Prussian blue with semi solid hints of silvery grey and black. “I am what I am” by Gloria Gaynor would be the best song/colour combination for me. The bright and strong colors of the rainbow, blend into each other, with highlight effects. Such a lovely giveaway, thank you. My suggestion would be my favourite song The Sound Of Silence by Simon and Garfunkel. And the colour could be grey or any of the neutrals, these shades don’t necessarily shout out their presence but form a muted yet strong base that allows the louder shades to pop out beautifully. Katy Perry Firework ? a dark blue with ALL THE SPECKLES!!!!!!!!! Color my World by Chicago – I love all colors! A rich deep golden colour, with perfect subtle shades of yellows, oranges and brown called Whisky in the Jar for an irish folk song my father used to play in the car. As the song begins “Outside the leaves are falling”, beautiful fall leaf colours would be perfect. I’ve been revisiting Fleet Foxes a lot this month, and I think Blue Ridge Mountains would make a great name for a colorway. I’m imagining something variegated in soft blue tones, maybe with some hints of green and light gray too. Thanks for a lovely podcast! Atomic by Blondie- charcoal grey. Thanks for the giveaway! Lovely giveaway! Don’t panic by Coldplay. It would be a serene sky blue..
Fire & Rain, autumnal colors ???? Absolutely just love Clara Parkes! When I first started to knit I purchased the knitters book of wool and deleted deep into it! Cannot wait to read this latest novel! I loved the podcast and thank you for hosting this generous giveaway! I think I would name a colour after the song “Lemonthree” and it would be a yellow with a little bit of green in it. I thoroughly enjoyed hearing Clara Parkes speak and read from her book at Pom Fest. I have been dying to get my hands on the book and dive in ever since. I would choose the song, The Girl from Ipanema by Astrud Gilberto. It always puts me in such a relaxed mood to knit. 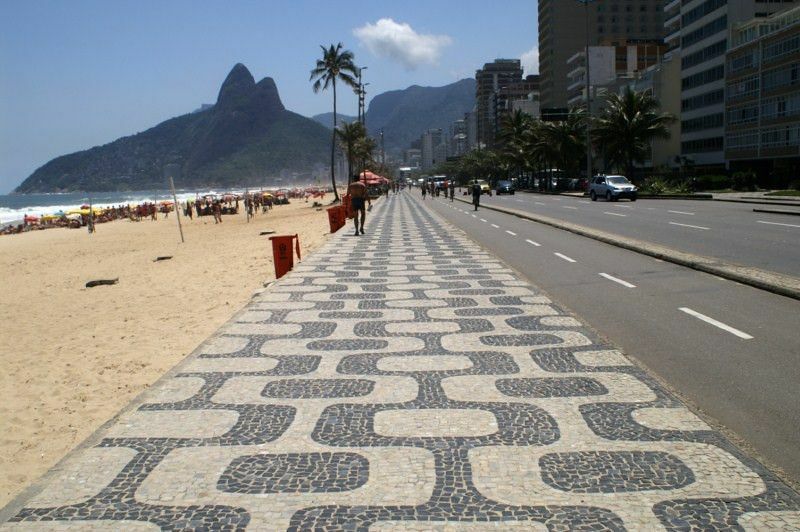 I would imagine the colour would be black and white, based off the seaside paving in Ipanema. There might even be a splash of a nice feminine pink ( or some fun colour) sparingly to represent the girl walking down the paving. It would have to be – Romeo & Juliet by The Dire Straits… One of my all time fav’s! Maybe in a dirty dusky off pink. It has to be a The Smiths song, I think Oscilliate Wildly – which would be a gloriously multi-coloured, shimmery yarn! “que sera sera” in that shade of jade green that reminds you of open topped sports cars and the Riviera! “Life on Mars” by Bowie could be a rusty red. Or maybe “Wipe Out” by The Ventures could be an ocean blue. I was listening to Rock DJ by Robbie Williams today, and, inspired by the video, I think mostly red with some white bits would be lovely. Killing me softly with his song – a dusky pinky grey …. Loved hearing the book reading thanks! Les laques du Connemara – all the shades of blue! Purple Haze (Jimi Hendrix) – black and purple with yellow bits. Speckles maybe? I just discovered your Pomcast and love it (and Clara Parkes)! A black yarn with a bit of dark blue and purple for the Beatles’ Blackbird. I enjoyed my first listen of the audio blog. Katie from Inside23 spoke about Clara’s book and your blog. What a great prize! hello! I’m late chiming in but I wanted to say that I really appreciated what you said in this podcast about the comments on flattering clothing in the last episode. I was so surprised to hear it being mentioned, and it was very touching to know you’d taken the feedback thoughtfully. I didn’t want to write a comment this time around until I really knew what to say, but I think I’d rather pass along my appreciation and thanks for the discussion sooner than never. And of course, thank you as well for the lovely work you do in the magazine and podcast. Hi What is the name of the stitch in the picture here above in the beautiful turkois wool?